Data Quik is a multipurpose Database Copy Utility. Copy data from selected fields and records between DBase, Paradox, Access, Excel and many Lotus Files. Data Quik is a multipurpose Database Copy Utility. The Database File Copier will Copy data from selected fields and records between DBase, Paradox, Access, Excel and many Lotus Files. There are Database File Utilities such as Browse, Delete, Copy, Save and Send over the Internet. 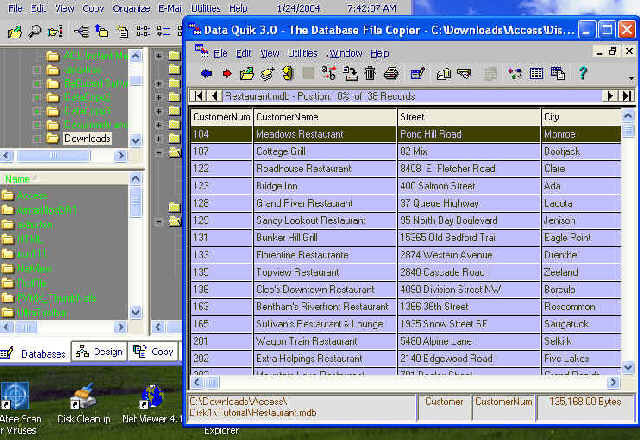 Compatible with DBase, Paradox 5.0, Access, Excel, and Lotus Files. Additional features as Copy File Formats between DBase, Paradox and Access Files with or without Table Data. Browse, Query, Find, and Print functions for Database files supported with this software. Print Database Table Data sorted by Index or Documents. Design, Create or Change DBase, Access or Paradox File Structures with Indexes preserving Table Data. Supports Windows 95, 98, Me, Windows 2000, and Windows XP.